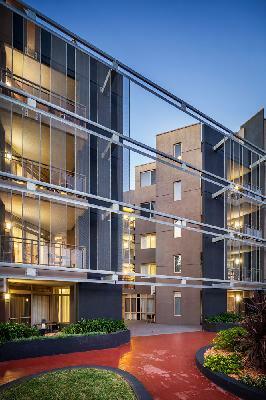 Providing convenience and style, Quest Castle Hill Serviced Apartments boast quality 4 star modern studio, 1, 2 and 3 bedroom apartments accommodation in western Sydney providing easy access to Norwest Business Park all that the Sydney Hills district has to offer. Situated a stones throw from Norwest Business Park and just minutes drive to the Castle Hill Showground and Castle Towers Shopping Mall, plus a host of function venues and sporting facilities, Quest Castle Hill Serviced Apartments is ideal for both the business and leisure guest. The Quest Castle Hill is close to everything that Sydney has to offer and features numerous guests facilities including business centre, conference centre, direct internet access, disabled facilities, faxing facilities, free car parking, guest laundry, gym & fitness equipment, lift, bbq, airport shuttle, security, baby cots available and babysitting service. Corporate clients are also well catered for at the Quest Castle Hill Serviced Apartments with dedicated telephone lines for fax/modem access and wireless broadband internet available in every apartment, faxing facilities, photocopying services, secretarial services, internet connectivity, computer modem hookups and conference/meeting facilities. With all the comforts of home and the convenience of its location, Quest Castle Hill is the perfect accommodation choice for the corporate traveler to Norwest Business Park. Nearby Attractions : Castle Hill is the urban hub of the Sydney Hills district and home to the rapidly expanding Norwest Business Park, located just 1.5km from Quest Castle Hill. Modern restaurants, cafes, shopping and local attractions are also just minutes away: The Sydney Ice Arena, Castle Hill Showground, award winning Castle Towers Shopping Centre and Hillsong Church are just a few of the places to visit, Wondabowl Ten Pin Bowling, Castle Towers Shopping Mall, Castle Hill Show Ground, Koala Park at Featherdale Wildlife Park, Ice Skating at the Sydney Ice Arena, Isis Health Club and Gymnasium, Parklea Markets, Castle Hill Country Club, The Edge Adventure Centre, Hillsong Christian Life Centre, Numerous Wedding and function centres close by Kellyville Netball Centre, Valentine Soccer Park, Restaurants, Clubs. The award winning Castle Towers Shopping Centre, Castle Hill RSL with live entertainment, Gaming facilities, restaurants, function facilities and children's playground, Wonderbowl Ten Pin Bowling Centre (walking distance), Isis Health Club (walking distance), The Edge Adventure Centre indoor rock climbing, abseiling, high ropes (walking distance), Featherdale Wildlife park, a scenic drive to Wiseman's Ferry, Golf at the Castle Hill Country Club, Parklea Markets, Historic Rouse Hill Estate, Telstra Stadium and Rosehill racecourse. 1 Bedroom Apartment : Sleeps up to 3 guests on 1 Queen Bed Or 2 Single Beds + Roll Away Bed Extra..
2 Bedroom 2 Bathroom Apartment : Sleeps up to 5 guests on 1 Queen Bed And 2 Single Beds + Roll Away Bed Extra..
3 Bedroom 2 Bathroom Apartment : Sleeps up to 7 guests on 1 King, 1 Queen & 2 Single Beds + Roll Away Bed Extra..
Executive Queen/Twin Studio : Sleeps up to 2 guests on 1 Queen Bed Or 2 Single Beds.